Return of the Auto Union? As Volkswagen and Porsche are getting closer to making their merger official, the question of what to name the new company arose. According to Dr Ferdinand Piech, Chairman of the Volkswagen Group, the long defunct "Auto Union" name may be used for the new umbrella company. 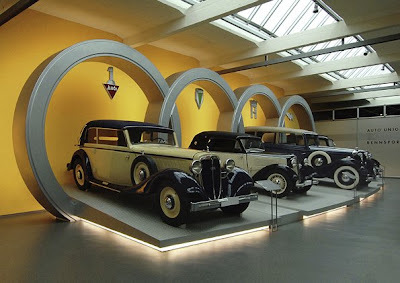 Established in 1932, during the Great Depression, the Auto Union consisted of four companies; Audi, DKW, Horch and Wanderer. The company used the logo of four interlocking rings to stand for each of the four companies incorporated as one. As we all know, that same logo eventually carried over to Audi. The name may be appropriate considering the new VW-Porsche company would consist of 10 total brands under one umbrella company. However, the Auto Union name does harken to a very dark time in Germany's history. Designed by Ferdinand Porsche under the commission of Adolf Hitler, the Auto Union's famous Silver Arrow race cars built as a demonstration of the engineering superiority of the Third Reich and dominated Grand Prix racing of the time. Only time will tell if the four rings will eventually stand for not only Audi but it's 9 sibling companies under the VW-Porsche powerhouse.